African Pygmy Falcons live in dry bush in parts of eastern and southern Africa. These little cuties measure just over seven inches long, making them the smallest bird of prey found in all of Africa. African Pygmy Falcons, also known simply as Pygmy Falcons, have a unique way of nesting. They use empty compartments in large Sociable Weaver nest structures, or abandoned nests made by other weaver species. Pygmy Falcons are also known to nest in polyandrous groups, with more adult birds than just the breeding pair caring for nestlings and chicks. The African Pygmy Falcon was added to Birdorable on April 25, 2012. If you can't get enough of these adorable little raptors, be sure to check out our range of unique Pygmy Falcon t-shirts and gifts! Falconry is the sport of hunting with a trained bird of prey. Peregrine Falcons have been popular birds among falconers for thousands of years. When the species became endangered due to pesticide use in the 1950s, 60s and 70s, the expertise of falconers was instrumental in the eventual recovery of the species. In 1970, the North American population was believed to be just 10 or 20 percent of its historical average. The species was added to the Endangered Species list in 1975; at that time there were just 324 known nesting pairs in the United States. Harmful pesticides like DDT were banned, but the population needed additional help in order to increase their numbers. Because Peregrine Falcons breed successfully in captivity, falconers continued to raise and hunt with captive-reared birds during the time it became endangered in the wild. Later, captive breeding and release programs in the United States, Germany, and elsewhere were extremely successful. These were done with cooperation between government agencies, non-government conservation groups, and experienced falconers. Today, the Peregrine Falcon is no longer on the Endangered Species list and populations have rebounded across much of their near-worldwide range. Peregrines have adapted to nest in urban and suburban settings. In the United States, many urban Peregrine Falcon nests are monitored by volunteers or via remote cameras. Birdorable fans know that our favorite Peregrine Falcon camera is the Rfalconcam in Rochester, New York. Today's latest Birdorable species is a fantastic bird of prey from Australia: the Black Falcon! 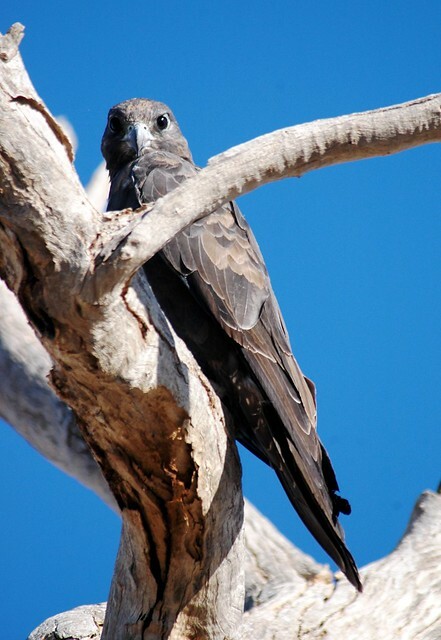 The Black Falcon is a species of raptor endemic to Australia. They are found across a wide range which covers roughly the eastern two-thirds of the continent. Black Falcons have an overall dark plumage. Young birds are nearly completely black. Birds become lighter as they age; older Black Falcons are usually a dark sooty brown color overall. Tomorrow's species is a long-legged bird of South American grasslands. Can you guess what it will be? After a very turbulent early season, there is some wonderful news out of the Rochester Falconcam today. The star Peregrine Falcon pair Beauty and Dot.ca became proud parents with the hatching of their first chick early this morning. Here is a screen shot of Beauty, the fluffy chick, and the two remaining eggs. The season began with Beauty in rehab and different female Peregrine Falcon at the nest site. In fact, one of those remaining eggs wasn't even laid by Beauty! Follow the link to the Imprints blog at the beginning of this post for a quick catch-up on this dramatic breeding season. We continue to support the Genesse Valley Audubon Society in bringing the Rochester Falconcam to the world. New designs featuring our updated Birdorable Peregrine Falcon reflect this year's changes to the players in this year's drama. As always, 30% of the retail price for all Birdorable Rochester Falconcam product sales will be donated GVAS. You can also donate directly to the Rfalconcam via this link: Individual Donors. Follow Rfalconcam on Facebook to stay updated! The American Kestrel is the smallest species of falcon in North America. The plumage of male and female American Kestrels differs significantly, which is unusual among birds of prey. Kestrels like to dine on insects, small rodents, and sometimes even other birds. One method they use for hunting is to hover into the wind and look down on the ground for available prey items. We have recently updated our Birdorable American Kestrel. In addition to the perched male and hunting male, we offer a perched female American Kestrel cartoon on apparel and gifts. Eggciting news over at the Rochester Falconcam! After a season of uncertainty and no nesting activity last year, the Peregrine Falcons at the Rochester Falconcam are back in business with two eggs laid so far. I have been looking at the main view camera for a few minutes this afternoon and it appears Beauty might already been sitting on the eggs, so the third and final (??) egg might be laid soon. This is the first nesting attempt by the pair Archer and Beauty, and it will surely be an exciting website to keep your eye on as the season progresses! The Rfalconcam website has been updated with easy access to the five nestcams, forum, blogs and shops where you can buy Rfalconcam gear. Birdorable Archer and Beauty swag is available too, with 30% of the sell price on all merchandise being donated to Genesee Valley Audubon, who manage the nestcam.